Pain Physicians NY (Brooklyn & NYC) provides a full range of Joint Injections (Sacroiliac Joint Steroid Injections) as well as advanced pain management services including electrical nerve stimulation for chronic pain among latest cutting edge procedures: Stem Cell Therapy, Body Composition Analysis, High Tech Shockwave Therapy, groundbreaking Interstitial Laser Therapy. The sacroiliac joints are located at the bottom of the spine between the sacrum and either of the ilium. The sacrum is the bone that supports the spine just above the hip and can be easily felt by touch. The ilium provides a joint for the femur and joins with the sacrum at the sacroiliac joint. The sacroiliac joint joins the sacrum and ilium through a series of strong ligaments that provide most of the support. However, due to injury, abnormal movements or a preexisting condition, the sacroiliac joint can become infected and consequently inflamed, causing a lot of pain to the individual. Being a major joint in the body, complications with the sacroiliac joint can have debilitating consequences. The problem is mostly noted through pain around the hip including lower back pain, hip pain, groin pain, urinary frequency as well as transient numbness, prickling or tingling. These symptoms often become worse during physical activity and also due to prolonged static positions like sitting or standing for several hours. In women, there have been reports of pain during menstruation due to these problems. There are still no definitive tests for analyzing the sacroiliac joint for any problems, although SPECT and CT scans will sometimes show abnormalities. Some clinicians will attempt mobility maneuvers like standing flexion test or sitting flexion tests to try and detect abnormalities. It’s not effective, though, because sacroiliac joints are very variable from person to person and an accurate diagnosis may be difficult. There is no clear diagnostic procedure for sacroiliac joint dysfunctions, but there are other more effective manoeuvres that can be used like the thigh thrust, iliac gapping and compression tests and the Gaensien test. When several manoeuvres and scans are performed, it can be possible to arrive at an accurate diagnosis for the condition. The type of treatment prescribed to the patient will usually vary depending on the severity of their pain. For mild pain, the patient may be advised to attempt home remedies such as applying ice and regular physical therapy. On the other hand, severe pain can cause the patient to be disabled, in which case, injections may be used. Proving that the source of the pain was a sacroiliac dysfunction. Diagnosing sacroiliac joint dysfunctions is difficult, but relief after the injections identifies the source of the problem and helps tailor a treatment plan. The pain tends to relieve for a few weeks, leaving the patient active. However, it does not always work in severe conditions, and surgery may be required in such cases. 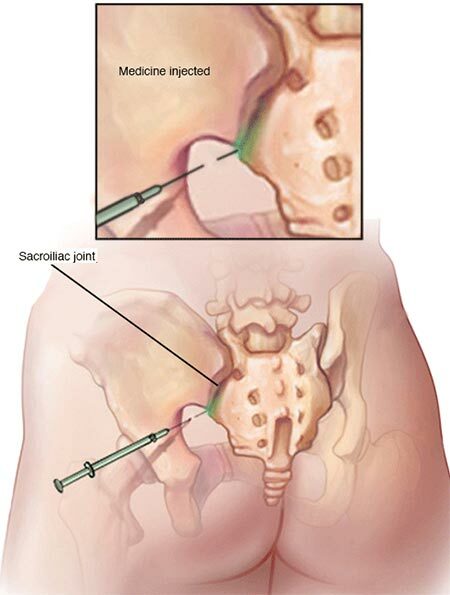 Like any other medical procedure, sacroiliac joint steroid injections have also their own side effects, risks, and possible contraindications.